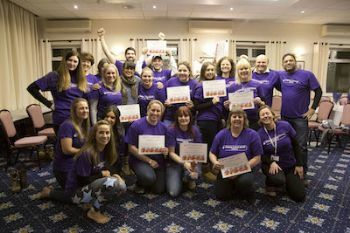 Squire's Garden Centre staff member Lynn Street recently took part in a charity fire walk in West Byfleet to raise money for the Woking and Sam Beare Hospices. Ms Sleet, who described the experience as "an amazing experience and such fun," walked 15 feet over hot coals and embers burning at 1200 degrees along with her daughter Frankie. The Woking and Sam Beare Hospices is a cause close to the pair's heart as they helped when Lynn's husband passed away 15 years ago. It is also Squire's in Woking's chosen charity of the year.